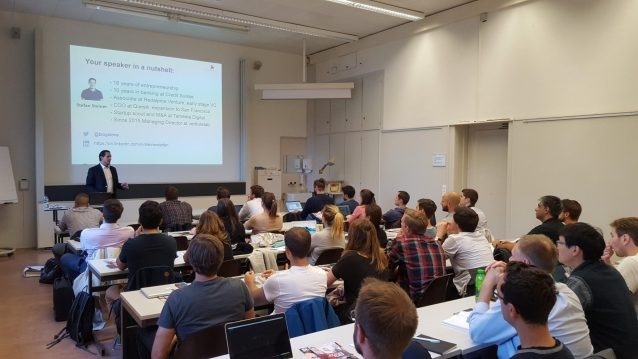 On a regular basis the ETH Entrepreneur Club provides us exciting blogs about the Startup Essentials (#vlabSE). The topic of the first lecture of this semester in the Startup Essentials Workshop Series by venturelab was pitching. • The elevator pitch lasts about 30 seconds and has the goal of quickly generating attention. • The investor pitch, which lasts five to ten minutes, is intended to convince investors to buy-into your idea. • The sales pitch addresses customers directly and should convince them to buy your product. Right from the beginning, the participants were asked to perform an icebreaker elevator pitch in front of everyone, so as to get to know each other. The presented ideas varied from fully-autonomous cleaning robots for gyms, or a user-friendly consumer goods shipping service, to a time-saving computer modeling system for simulation and testing. After a short refreshment break, the evening continued with crucial steps on how to prepare a perfect pitch. The key questions which have to be answered during a pitch are: why, what, and who? It is very important to keep the pitch short, and not get lost in the details. Though, this is not as trivial as it sounds, as any passionate entrepreneur is always tempted to detail the what and how of his or her project! In this case, as in so many others, practice makes perfect. An important piece of advice was to keep a pitch deck of ten slides with straight-forward statements about the start up. The slides should be simple and contain mainly bullet-points. For people with mostly academic backgrounds, it is especially important to build up credibility by showing that they know about the target market and have the required skills for a good execution. After another break, the participants were asked to prepare part of their own pitch based on the material presented during the seminar. Every group had to prepare one slide focusing on the value proposition of their startup. The slide would have to show the current market situation, what opportunity they seek, and explain how their product will solve this problem. All in one slide! Four startups presented their slides and received constructive feedback from the audience of supposed investors. The main challenge during this task was to explain the idea of the startup in a simple and non-technical way, so that everyone could understand what was the service or product and the business opportunity. In the end the participants received a range of essential tips on how to boost their chances of success in the startup world.